“Overwrought,” a fashion for Antoinette. My contribution to the MetroDolls 2013 Charity Auction benefitting hunger relief charities. Click here for a peek at some of the auction items. I wanted to make something special and unusual for the auction. I started to develop the idea for an outfit during a trip to Savannah, Georgia back in the spring. We walked all over the city, enjoying the parks and beautiful homes. 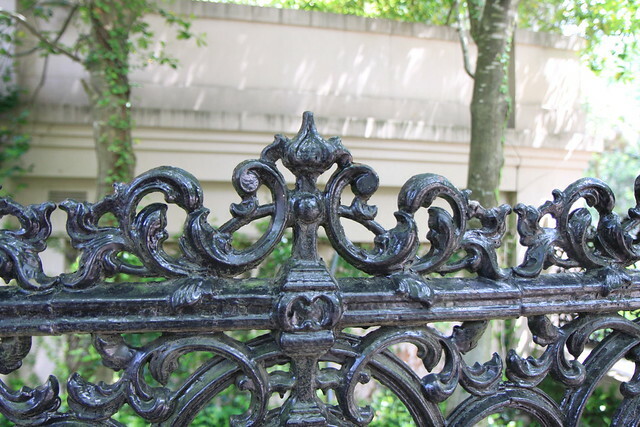 So many of the homes had ornate ironwork and beautiful gardens — that’s what I tried to incorporate into this fashion for Antoinette. The corset is intended to look like wrought iron — there’s even a little faux rust. The skirt includes a Southern Belle style cage and an over-skirt made of antique lace with a floral pattern. The outfit is completed with tall leather gloves and short black boots. The boots have chains and a lock — something you might see on a wrought iron fence. 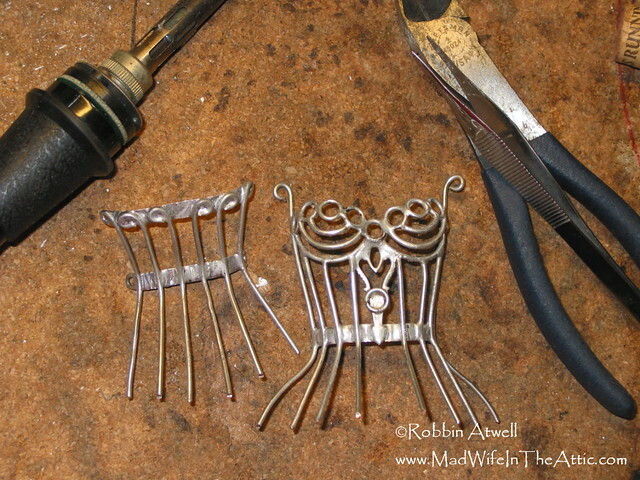 Work In Progress: I’ve just finished soldering the corset together. Work In Progress: Fitting the corset with the skirt cage. Work In Progress: Fitting the antique lace overskirt to the cage. 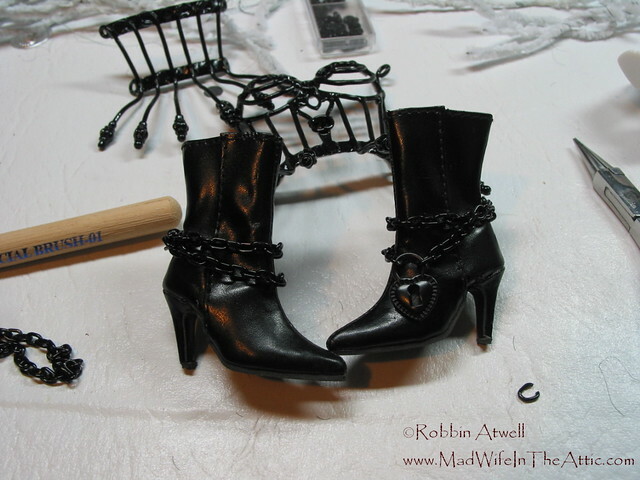 Work in Progress: Commercially made boots with added chains and a lock. I named this fashion “Overwrought” because I was imitating wrought iron, but also because “Overwrought” also means excessively decorated and complicated when describing art. 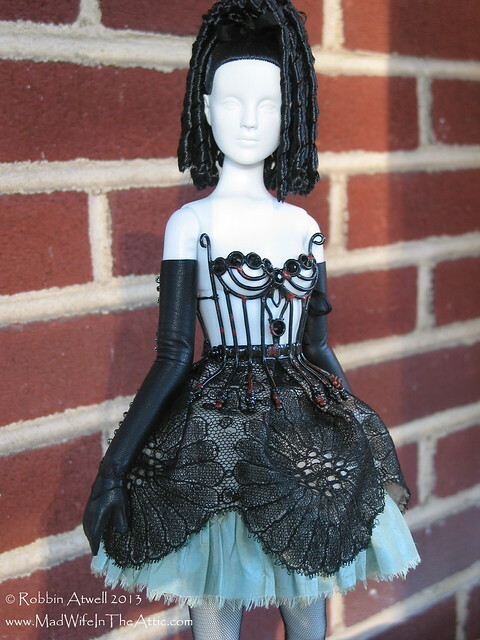 When it comes to doll fashion, it’s difficult to achieve excess! 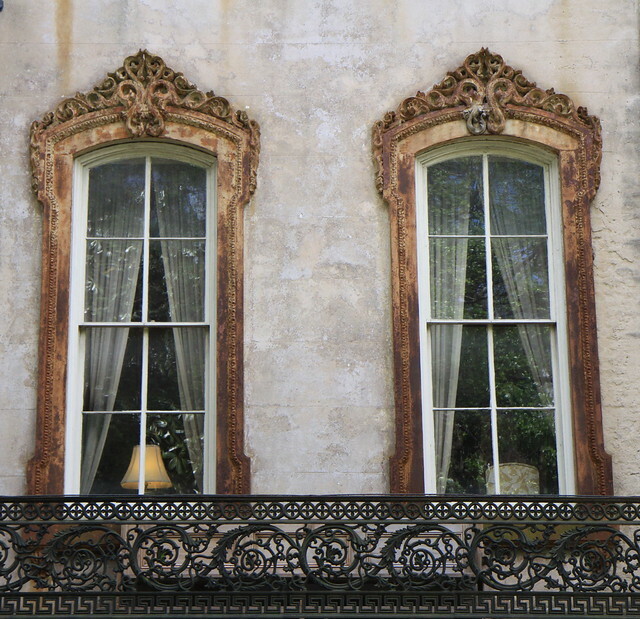 Dreamy windows in Savannah, Georgia. 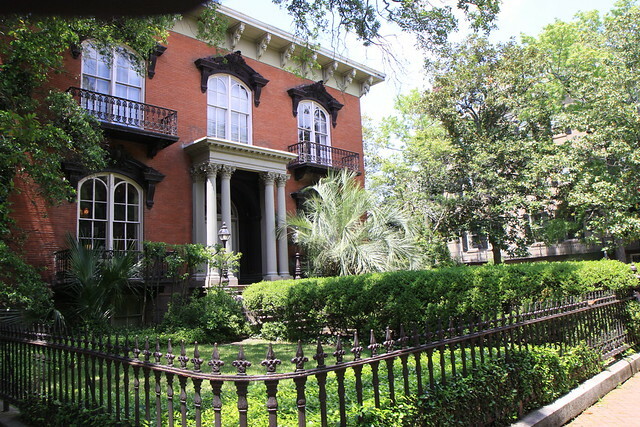 Side View of the Green-Meldrim House in Savannah Georgia. 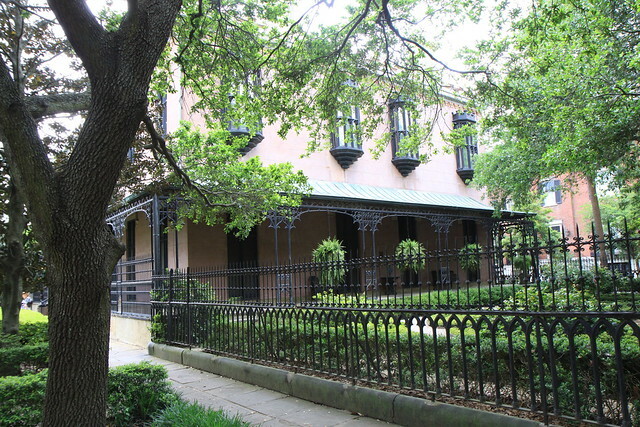 This house was used by Sherman as his headquarters until the end of the Civil War. 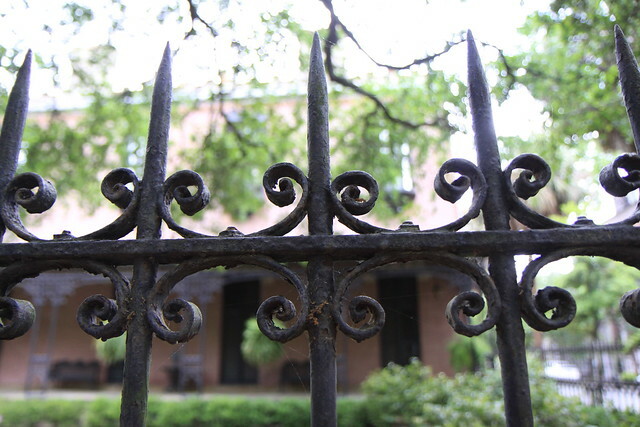 Wrought iron fence in Savannah, Georgia. 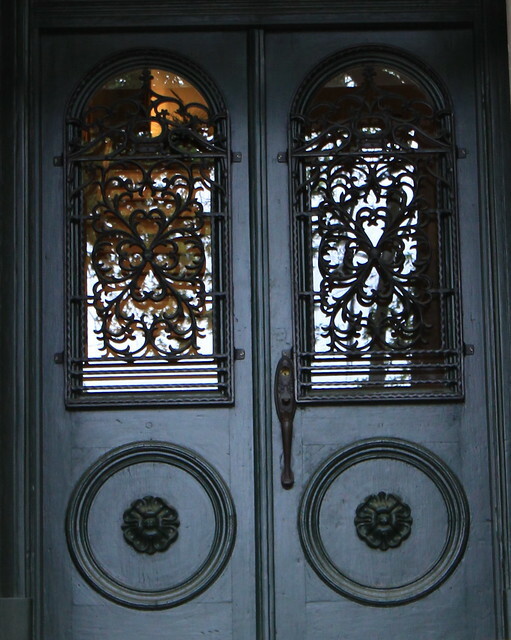 Beautiful doors of a private home in Savannah, Georgia. 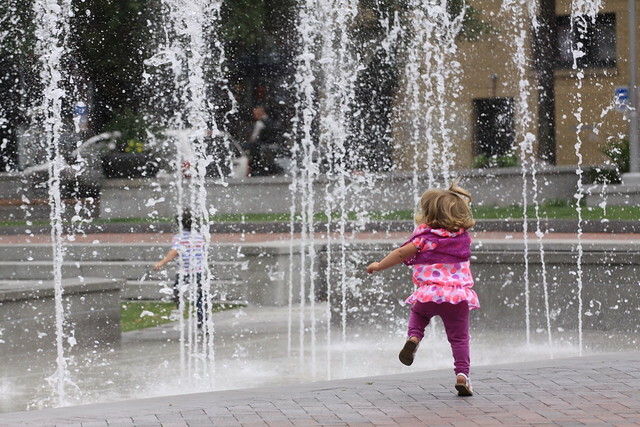 And we all need a little more of this in our lives — this is a little girl enjoying the fountain in one of the many lovely squares in the city. 26 Sep	This entry was published on September 26, 2013 at 4:31 pm. It’s filed under Doll Clothes, Events and tagged 16" Fashion, Antoinette, Doll, Elijah's Promise, Event, Fashion, Hunger Relief, Luncheon, Mad Wife In The Attic, Meals on Wheels, MetroDolls, Robbin Atwell, Robert Tonner, Savannah, UFDC, Wrought Iron. Bookmark the permalink. Follow any comments here with the RSS feed for this post.